It’s no secret that a lot of rap and hip hop lyrics are filled with sexism and misogynistic culture. Not to mention the ridiculous portrayals of women in the accompanying music videos. We’re not even gonna go there, and we don’t have to because a North Carolina student has expertly done it for us! 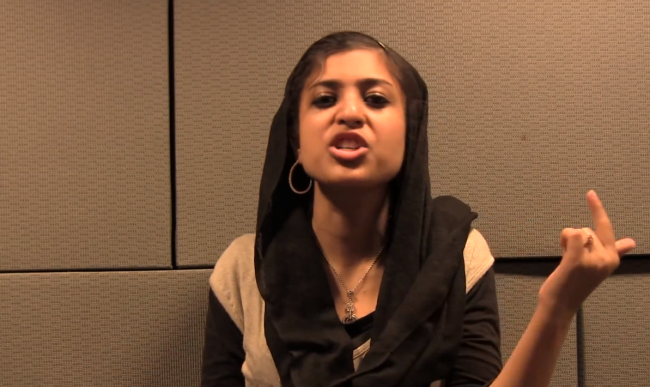 Madiha Bhatti, a student at Chapel Hill and also a proud Muslim woman posted this poetry slam in November 2012, but it has been generating quite a bit of heat online lately. In her rhyme, which we have transcribed below, she calls out the Jay-Z’s of the genre who are bent on portraying women as second class citizens, and says what we are all thinking: enough with the misogyny! If these musicians are talented regardless, why do they need to objectify women to rise to the top? It’s a challenging question, and certainly a controversial topic. But Madiha’s words will make you think and question the next rap or hip hop song you hear, and that’s a good thing! Madiha is an English and Biology double major minoring in Women’s and Gender Studies. She wants to have a career in medicine, focusing on women’s health. Clearly her education is having an impact on her in a profound way and for that we are grateful. We are stoked to see this video getting so much attention on the internet right now, and we hope it will spark more important conversations in our everyday culture about sexism and gender equality. Here is the full video, and we have also pasted the lyrics below. This is one video you must watch today and share with all your friends. It is worth it! What does this look like to a child? When her idol doesn’t wear them in a video? I mean does anyone even know that Beyonce’s smart? Does her husband have that problem? What can she do, to ease her strife? This is powerful and well said!! You go girl! ^ Same here! I wanna quote this in my paper! This shoul get published! Why do we never hear of people like this anyways?